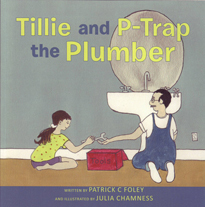 Building HVAC engineer Patrick Foley was inspired to write Tillie and P-Trap the Plumber (2014) after his four-year old granddaughter helped him with some plumbing work. The easy-to-read booklet encourages young girls to be curious about traditional male pursuits. It is illustrated by Julia Chamniss.